As a portmanteau for “rolling” and “index,” the term “rolodex” has entered the English lexicon to mean a list of one’s business contacts. Though the term can be used broadly, it also refers to the brand name Rolodex—the company that made this swivel file. Devices such as these allowed the user to type or attach a person’s name and contact information on special notched cards made for the Rolodex system, so the information could be quickly and efficiently accessed. The rolodex entered the office supply market in the early 1950s and was officially patented by the Zephyr American Corporation in 1956. Throughout the second half of the twentieth century, Rolodex produced over thirty-two variations of this filing system. This is just one of the many iterations of the basic rolodex form. The Rolodex Company claimed that they sold 10 million rolodexes each year throughout the 1990s, highlighting just how ubiquitous these objects became throughout business offices. With the advent of cellphones and personal computers, the rolodex has become obsolete. Still, its legacy remains through the popular usage of its name. 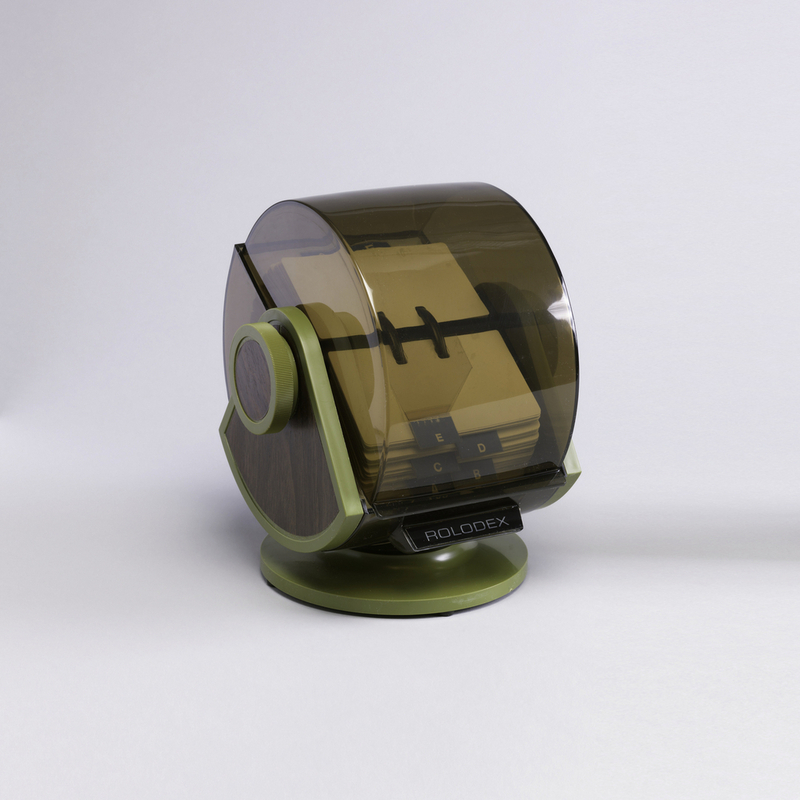 This Rolodex was a part of the Decorator Line of “Swivel Files,” and allowed the user to rotate the file 360 degrees. The manufacturer printed bold lettering on both sides of the alphabetical header cards so that the user could access the information regardless of location on the card spindle. Headings were also interchangeable, allowing the user to modify the device as needed. Besides their functional use, these filing systems were oftentimes visually pleasing; the mid-century modern aesthetic of this covered file, with its olive-colored plastic and faux wood surface, would have complemented one’s desk and reflected popular stylistic trends of the 1960s. The product packaging of this rolodex indicated that, “never has purity of line and color been so well combined with perfect function,” underscoring the important relationship between function and aesthetics.